Thread: It's August! Riding through the heat. Glad you're healing up, Crankin, and I am with you on fat bikes. At my size (about the same as you), I am just not sure I could power one unless I had a tailwind! Today is a usual off day for us for cycling, as the trail is too busy, but we needed to get some copies made at Staples and go to a couple of stores at the big shopping area in the south part of town, so we rode our cruiser bikes down on sidewalks and bike paths (different from our usual West Orange Trail, more urban) and got that done. Coupled with some loops around the campground we got in about 10 miles. When the wind was at our back, it was a blast, but the cruiser bike is tough to pedal into the wind, so I was happy to get done with it. Tomorrow morning I have an orthodontist appointment, so no riding, but expect to get out for our usual ride on Tuesday. DH is healed up from his crash, thankfully, so we got in three longer rides last week (MWF). We're enjoying doing long rides three days a week instead of four, as we get a lot more done on that one additional off day and enjoy the days we do ride more, since none are back-to-back. You're right, Crankin. Those big heavy fat bike tires are harder to pedal. I'm so used to pedaling them, that I hardly notice, anymore, unless I take one out for a 30 mile ride or something. My friend's visit and attempt to ride any form of trail bike, including the fat bikes, was a reminder that there are lot of people out there riding bicycles that really aren't comfortable with MTBs or even drop bar road bikes. Her other complaint about the fat bike was that it didn't allow her to sit upright. She felt very uncomfortable with her weight down on the handlebars. Anyway, we had a great visit. Nothing like catching up with an old friend and just talking and sharing stories. Her visit meant a lot to me, what with me being so far away, up here in the woods. We did solve her bike riding problem, by the way. After a try with the MTBs out on the road (no way was she ready to try trail riding) and her disappointment, I remembered I had recently bought a Specialized Roll Low Entry comfort bike as my indoor training bike while I recovering from my accident. Took the Specialized off the trainer and got it adjusted for he and then out on the road we went. She loved it! Remember, now, she hasn't been on a bike in over a year and even then, she's never been much for riding. She struggled on our neighborhood hills a bit, but she really enjoyed the riding, enough so that she wanted to do, more. 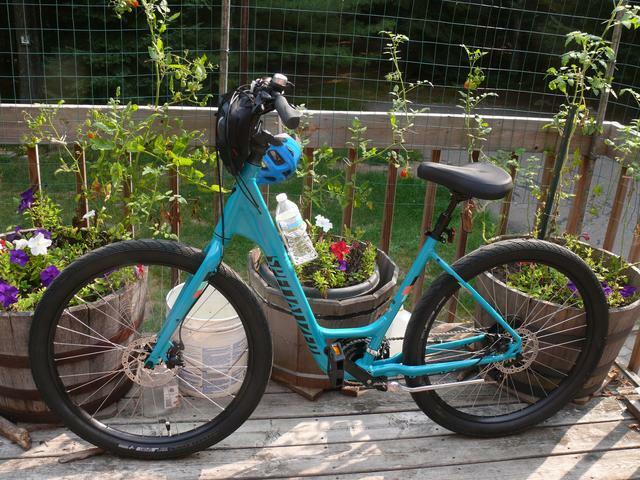 In fact, she loved the Specialized so much, she decided to buy one for herself. I offered her mine, but she did not like the matte black color and can't say I blamed her. We took her to one of my shops and they set her up with the slightly more advanced model with disc brakes, a triple crankset, and, most importantly, a nice color. And they made her a great price, to boot. She will be riding this around her neighborhood and town and using it to visit friends. She couldn't wait to drive back home and start riding. I am so pleased that the bike industry has recently been addressing the need for people like my friend. It's long overdue, in my opinion. I've been trying to find her the right bike for years and trying to get her to get out and ride more, but with little success. I think we've finally found the right bike for her, though. I just loved seeing the smile on her face while she was riding her new bike. You've got me interested. Send me a private message here, or on FB. That is a cool looking bike, NW. And what a nice story about your friend. I love to see people riding those kinds of bikes. Now that we have a trail close by, I see more of them, and I always compliment the bike. There *should* be a bike for everyone. Eh, I don't want to go to work. Thoughts of quitting in my head, but I know I'd be bored to death, without DH around. I'll be fine once I get there. Sheila, an encounter with someone who caused a decrease in your enjoyment of riding is a serious matter. I hope isn't a permanent thing. PM me if you think I can help. Worked hard - as in some heavy labor - on a section of trail, yesterday, removing some rocks and nasty roots. My neck and body managed it, though I fell asleep in my chair, last night. It's all part of my ongoing project to make my trails safer and more comfy to ride. I'm hoping to be able to ride MTBs with standard width 2.25" tires with minimal risk on selected sections of my trail. That will still leave some sections that are really plus or fat bikes, only sections. I still enjoy a casual ride in the woods with the Log Lady single speed or other "skinny" tire bikes. Despite the recent heat, I'm already seeing signs of fall. That's a reminder that I will be going fat bike, only, for my riding soon enough. Oh, well, this will be a summer I will never forget. Reached a an encouraging milestone, this morning. For the first time since my accident, I wads able to complete over 5 miles of trail riding. That was my usual workout before the accident. Better yet, I did it on the single speed Log Lady with its 2.25" tires and my neck managed it just fine. My legs, too. Took it slow and easy and, especially, safe, but I'm now confident of riding standard MTBs on the trail, again. Just have to be aware of how to ride safely with these standard width tires. After all, the Log Lady is a racing MTB and it is designed for trail riding. Just last week I was wondering if I had the LL geared a bit too high for my trails. Not today, though. Gearing was just right. Fall like weather, today. Highs only in the 60s with a brisk north wind. Even had to wear leggings and a sweatshirt to be comfy. I think that helped me climb some hills with the single speed, though. Last edited by north woods gal; 08-21-2018 at 11:08 AM. Sounds like you had a great ride, nwg. Fantastic! We did our usual ride today, and it was fine, but still hot and humid. No signs of fall here yet, but that is to be expected. Actually, there is one sign, and that is no kids on the trail during the week now that school is in. A nice change! Ended up with 34.7 miles, followed by a nice cool down in the pool, even though it's not especially refreshing right now -- at least it's cooler than riding. My Ariel is built! DH thought he would be finished on Sunday, but because my bike is so small, the rack needed some special clamps to be attached, so it doesn't fly around. They came today, and DH had just finished putting them on when I got home. Of course, it is going to rain torrentially tomorrow morning, so I am going to the gym. But, it might be OK to test it out in the afternoon. I am hoping to ride it to work Thursday, but given my shaky transitions to new bikes/geometry, I need to ride it a bit before I head into traffic, even for a 2.6 mile ride. I'll also be home early enough to maybe test it on a dirt road near me. Hoping I can out between rainstorms today, even if it's riding around my cul-de-sac. I have a lot of personal business to attend to today, which includes a spin/conditioning class at 8:30, catching up with friends about vacation, and getting to my endocrinologist for my Prolia injection. I will take pictures in the basement, if I have to. Sheila, my romance with the Jones bars was short lived. I found that the Jones bars have too much sweep for me to be comfortable. The Jones with its 45 degrees of sweep actually required me to bend my wrists from their natural position when reaching for the handlebars. That and I found that the actually H bar cross section was too short and narrow to use for alternate riding positions. Great idea, but just didn't wok for me. If you want one, be glad to let you have mine. Let me know. On the other hand, I found the new Surly Moloku with its 34 degrees of sweep to be perfect, plus I can get some very useable positions for riding on the cross brace. It's now standard on all Surly flat bar touring bikes. Great design. I liked the Moloku so much I even added one to the old Pugsley. Unlike the Jones, the Moloku also works very well for my trail riding. I can ride my single track very well with it. The Jones was like trying to ride single track with a 50s cruiser bike. Hated it it for trail work. The one disadvantage with the Moloku is the weight, if you're trying to count grams, because it is made of steel, not aluminum. Of course, if we Surly nuts were worried about counting grams, we wouldn't be riding Surly, anyway. As for stems, I always have to go a touch shorter on standard traditional unisex bikes like a Surly. Right now, I'm using a Salsa Bend 2 with 23 degrees of sweep for a handlebar on my Krampus with a very short 45mm Race Face stem. Went that short, this summer, to keep me more upright while my neck healed, but need to go back to maybe a 60 or 65mm, now, to get me into optimum trail riding position. The medium Krampus came with a 70mm stem from the factory. Just a touch too long for my short torso. Unless I'm buying a WSD bike, my rule of thing on stem length is to subtract 10mm for stem length on more traditional bikes like the Surly. Most current high tech MTBs, like my Norco fatties, already come with very short stems, so not always an option for me. Last edited by north woods gal; 08-22-2018 at 07:57 AM. Thankfully, it was not cold. I laughed like a kid and it was kind of fun. The disc brakes work great. I had to kind of get used to trigger shifters again. It does feel heavy. No speed records will be set on this bike, but I did get up to 13 on the flats and 17 on a little downhill. The rack and trunk bar do add some heft. I am not sure why this picture is rotated! Crankin, I'll bet that's a first ride you'll always remember. Really is just the kind of use that bike was made for. Sounds like you have a great utility bike in your new Ariel. Enjoy. As for me, my strength may be back, but my patience for riding those big fat tire bikes on pavement has waned since I started riding my super easy rolling single speed bikes. Those fast rolling bikes really do spoil you. Rode the old Pugs, this morning, on our morning ride and could just keep up with my hubby on his fat bike, instead of pushing way out ahead of him like I always do on the single speeds. Even with the low rolling resistance fat tires on the Pugs, it still rolled like the tires were glued to the pavement compared to my two single speeds with their super easy rolling 2.25" tires. Have to wonder why I am riding monster plus and fat tires on pavement, now. Probably time to be thinking of a more conventional road bike with standard gearing and normal tires, now, to supplement my road riding with the single speeds for summer riding. Just when I thought I had too many bikes, as it is, I'm thinking of another one, now. This is nuts. The two single speeds really changed my tastes in bikes. I was not expecting that. A steel bike at 23 pounds and lively and responsive XC geometry really is a joy to ride. The Log Lady, after all is a racing single speed MTB. Pretty thing, too, my Log lady. Have since changed out to smoother rolling XC race tires for even easier pedaling and more roll. That's a very important factor when calculating gearing on a single speed. You have to calculate and consider more than just gear inches when deciding what gear combos to use. How easily the tires roll is a big factor. Yet another factor when deciding on gearing is that single speeds are more efficient than derailleur bikes because the chain on a single speed always runs in a perfectly straight line and runs tighter, too. Lots more to this single speed stuff than I thought. Last edited by north woods gal; 08-22-2018 at 04:50 PM. I really know nothing about the color; this bike was hidden away in the kid's section of Belmont Wheelworks. It's a 2017, so it's been hidden for awhile! It is really an olive green, almost neutral looking. I am getting ready to ride to work. It's 62 out and feels cold! So, I put on my new Terry Soleil hoody that I snagged for half price. I probably will need a vest, too. I plan to take a longer ride home, since I am done at 3:45, but the Soleil is so light weight, I think it will be ok, despite being in the 70s. I have all of my clothes packed in the Topeak trunk bag. I haven't put my lunch or flat iron (it's a mini size) in yet, but I opened the expander. Before, I would always have to walk across the street to an office park that has a cafeteria to buy lunch when I rode, so this is nice. DH wanted me to get the larger size, but I thought it looked kind of too much and rather geeky. This is the medium size. I will report back later. Sheila, not sure how much help I can be on the stem and handlebar thing. It's just such a personal preference thing. I usually ride a bit and try different lengths of stems and figure out what I want through trial and error, but that assumes you have a lot of time to putter around and a bag full of different stems to try, which I do. On the Jones bar, for instance, I didn't change stem length at all and it put my hands comfortably on the controls where I wanted them. Also depends on your riding style, of course, and whether you like being stretched out a bit or whether you'd rather be in a more upright position. After my accident, I changed to shorter stems on a lot of bikes for a more upright position for the sake of my neck comfort. I like it that way and will probably stay there, now, since my riding has gotten more conservative. Getting in a low and aggressive crouch was almost a necessity when I was climbing boulders, hopping logs and doing jumps, but I'm now riding, dirt, only, both wheels on the ground at all times, as part of my resolution to ride safer. I now prefer MTBs with more traditional XC geometry and steeper angles than the now very popular trend for trail bikes with slacker geometry. Okay, sorry for getting geeky on everyone. Interesting, though, how my accident has changed my tastes and preferences and needs as to what I bicycle, now. Definitely see myself headed back into a more traditional direction. Would like to save the fat bikes, for instance, for winter riding, only. That leaves me with a couple of single speeds for the bulk of my summer riding. Would like to have more options for my summer riding than that. We'll see. Yeah, except he's in the Army, now. I can't remember if you knew that; when he wanted to go back as an officer, when he was about to start his junior yr of school, he was "too old," (30), without going through paperwork hell to get an exemption from the rule. He just wasn't up for it. Since he already was in Army Reserves, he joined ROTC at school. But, I still think of him as a Marine. Riding with the packed trunk bag was a challenge, in that climbing was hard! Not really any big hills, but I felt it on the way. On the way home, I took a 5.9 mile route home that includes a good climb; not steep, but long and annoying. It's somewhat a question of getting used to the gearing. It's a compact, but has really low gears, even lower than my really low gears on my 2 road bikes. So I either feel like I am spinning out of control and slow or it's too hard. By the end of the ride home, I was getting it more down pat. Still, very fun. I took the trunk bag off for my 1.3 mile ride to the gym at 5:15 am tomorrow. It will be my first test of riding with the flat side of the campus pedals. Thankfully, there's no stop signs where I'll have to stop and put my foot down, as this feels incredibly wrong to me when I am not clipped in. Love that bag! Going to save the link. Thanks. Gorgeous late summer day, here. Temps in the 70s with a brisk, though nice and dry, south wind. Did 17 miles of pavement on the single speed Log lady and loved it. This one is geared low for trail work, but it makes for a nice, easy pace bike out on the pavement. Did do a couple of my leg burner hills to make it a good workout, but most of the ride was on the flats. Can't get up much past 11 mph on the flats with the Log lady gearing, but one nice thing about going so slow is that I can relax and see wildflowers in the ditch, the birds around me, breath the pine scented north woods air and, in general, just enjoy my surroundings more than if I was riding a geared bike and worrying about trying to maintain an average speed. The other thing about a single speed that I enjoy is that they are so quiet. There's no chain noise or derailleur noise. All you hear is the gentle sound of tire on the pavement and on a fresh black top road, hardly even that. Did have to scare off a couple of deer with my bell, but it worked as intended, with the deer bouncing back into the woods rather than out on the road in front of me. Back home, traded the Log Lady for the new Pugs and hit the trails with Star. Really do like this new version of the Pugs with it's wider tires as a trail bike. Did 5 full miles of laps, then put the bike away and spent an hour cleaning my trails. Last edited by north woods gal; 08-23-2018 at 03:42 PM.